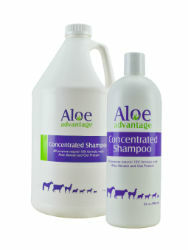 All purpose, natural, 10x formula with aloe, keratin and oat protein. Professionally formulated to cleanse and condition the hair. Enriched with natural extracts, this all-purpose shampoo moisturizes damaged hair, while adding body and a healthy, lustrous shine. Deodorizing active ingredient Ordenone®, encapsulates and eliminates foul odors that might attract flies. No drying soaps or alcohol. Fresh scent. No salts - plant based botanical formula. No coat stripping detergents or dyes. 100% Biodegradable. Can be used with spray applicators. For use on Horses, cattle, llamas, sheep, goats, dogs, cats and ferrets.